I’m a mom. Not to state the obvious, but there it is. 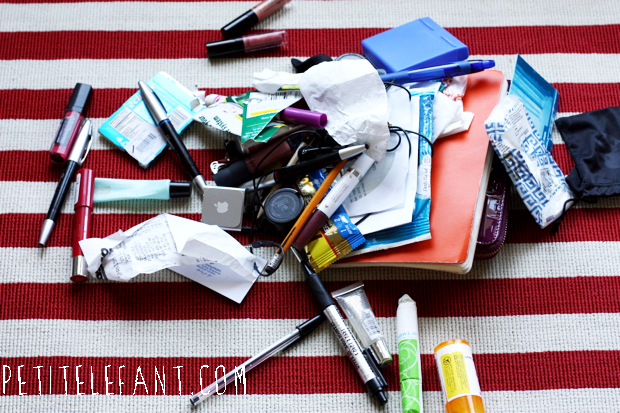 And as a mom I carry around a ridiculous amount of, well, crap in my purse. I’m not sure there’s a euphemism for the stuff I haul around on a daily basis. I’m super OCD (it’s not awesome like you’d think it would be) and my purse stresses me out to no end, all the mom paraphernalia I need just to get out the door. It’s the stuff of nightmares. About once a month, when it occurs to me my shoulders are extra achy, I look in my purse and realize I’m carrying enough nonsense to keep a small nation afloat for a month. 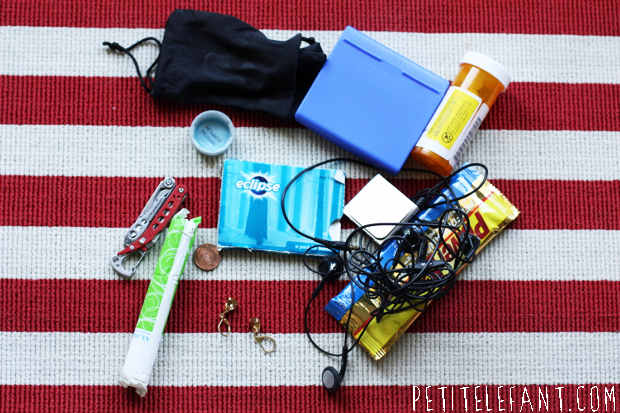 I usually put 5 things back into the purse and like magic, the junk multiplies and has junk babies. And the cycle continues. It’s pretty awesome. No, not really, no it isn’t. I’ve dumped out my purse before to show you what’s in my purse and what’s in my purse-within-a-purse and it’s like confessions-of-a-secret-hoarder every time. This is what I found inside my current purse (T.J. Maxx) when I dumped it out this week. Here we have everything. Oh, hey! There’s the iPod shuffle my husband has been looking for all month! And do I spy a tampon? THAT would’ve come in handy had I known it was in there. 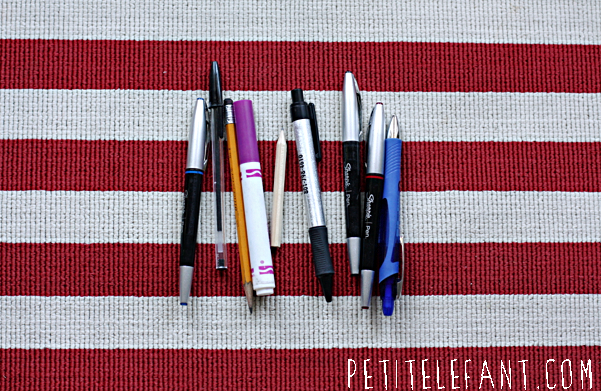 Anyone need a pen? Or a purple marker? How about a pencil from IKEA, I’ve got one of those too. Top L to R: two pouches for Skullcandy ear-buds, sans headphones, migraine medicine, protein bar (you never know when you’ll need one) Skullcandy headphones, sans pouches, iPod shuffle (there you are! ), my daughter’s earrings, a tampon, penny, Leatherman pocket knife, diet coke bottle cap (for the points! that earn you nothing!). 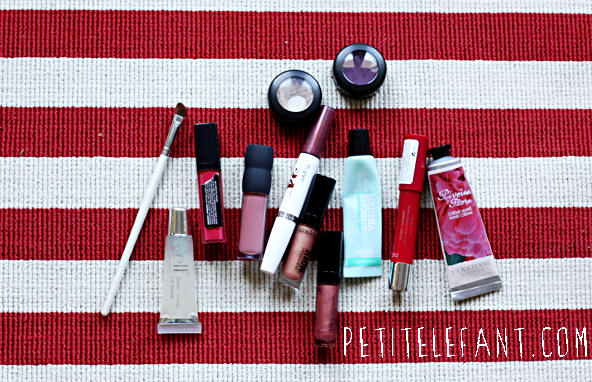 Oh hai there makeup. L to R: eyeshadow brush, ELF lip-gloss, BUTTER LONDON lip-gloss, Bare Minerals lip-gloss, Maybelline 24 hour lipstick, 2 more Bare Minerals lip-glosses, Bath & Body Works lip-gloss, Cover Girl lip stain, L’occitane hand-lotion. Top row: two MAC eyeshadow pots. Hello there fortune cookie fortune. I think it was a good one, so I kept it. Probably that’s why, that’s it! For sure. 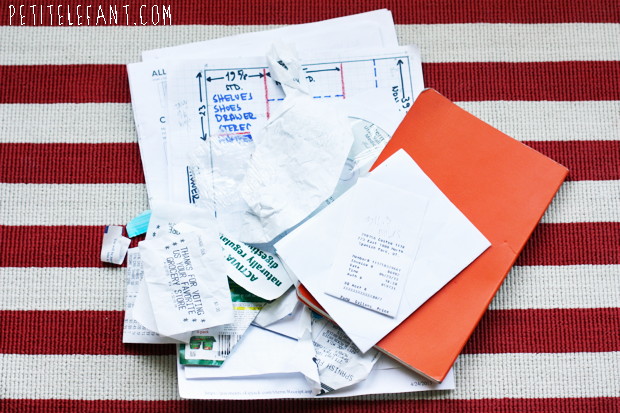 Grocery store receipts, empty gum package, yogurt coupons, IKEA closet plans, self-drawn closet plans (for the master bathroom remodel project), more receipts, notebook full of lists and lists and lists and random blog post ideas. *SIGH* I should be embarrassed about the state of my purse but mostly it makes me tired just looking at it. 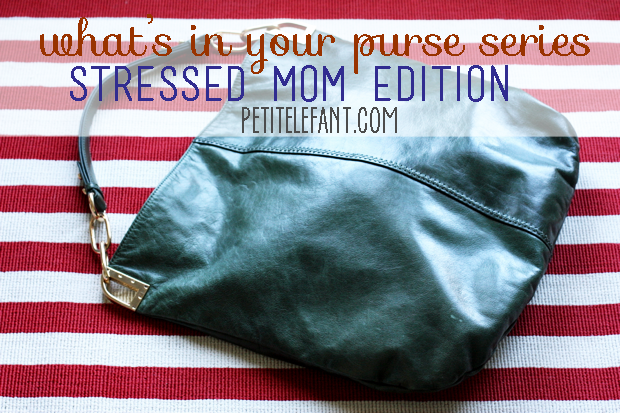 Is there a jail for offensive purse owners AKA stressed + busy moms? I can’t tell you how many times I’ve used the leatherman I carry in my purse! So handy!! And the lipstick can multiple so quickly–I have to stay on it and switch out colors daily, otherwise I’d be carrying 20. Wow! Just wow! The pens and lipsticks must be breeding in there! Oh Wait…. I forgot the straw, antibacterial gel and 1/2 of a 5 hr energy. Apparently, I only needed 2.5 hrs on that day! Oh Maxalt!! Isnt that a requirement in everyones purse? If only you it didn’t cost you every dollar to your name to buy it Loved your post.